The upcoming debut of MMA Fight Pit encounters a change in the lineup, as Jacob Clark steps in for the injured Lenny Lovato. Due to a broken hand suffered from training, Lenny Lovato steps out from his bout against Junie Browning at the upcoming MMA Fight Pit: Genesis. Stepping for the former is Jacob Clark. 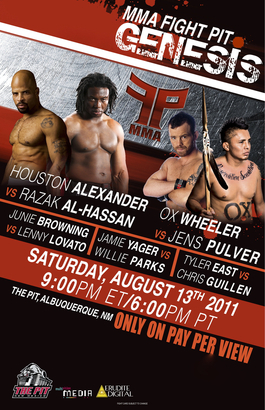 That said, Jacob Clark and Junie Browning will meet at the main card of the mentioned event. MMA Fight Pit: Genesis will feature a light heavyweight match between Houston Alexander and Razak Al-Hassan. The tournament will make its debut on August 13, Saturday, at The Pit in Albuquerque, New Mexico. The event will air via pay-per-view at Dish Network, Demand, AVAIL-TVN, DirecTV, Bell Express VU and Viewer’s Choice Canada. The current MMA Fight Pit: Genesis fight card is posted below.